Nearly 148 seasons after Lip Pike hit the first Jewish home run, a new milestone was set last night. Ryan Braun’s 428-foot, 1st-inning bomb tied the record established in 2016, when six Jewish players combined for a total of 115 home runs. Later Friday evening, rookie Rowdy Tellez’s 396-foot moonshot set a new benchmark with #116. Braun wasn’t done, however. His 8th-inning jack proved to be the game-winner for the playoff-bound Milwaukee Brewers and brought the Jewish total to 117, with 1-2 games left in the regular season. It’s been a team effort. 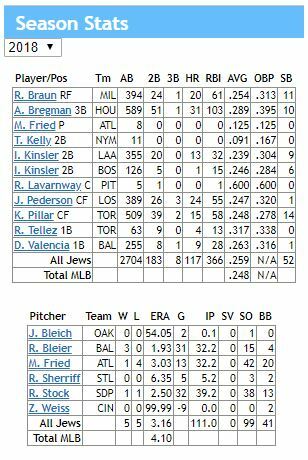 Eight Jewish players have homered in 2018, with five reaching double-digits and a sixth, Danny Valencia, stroking nine before being released by Baltimore in mid-August. Until recently, Alex Bregman — who leads all Jewish players with 31 HRs — seemed the player most likely to hit the record-breaker. But when his bat went cold several weeks ago, veteran Braun took over, hitting five longballs in his last four games.